Lunch: Daily: 11:30am - 2:30pm. Dinner: Monday - Thursday: 5:00pm - 10:00pm, Friday - Saturday: 11:30am - 11:00pm, Sunday: 11:30am - 9:30pm. An authentic 'wood fired oven' Pizzeria Napoletana restaurant & bar in the heart of Mountain View, California. We ate outdoors and it was lovely. The quinoa salads were delish, as were the calamari and pizza. The pans cottage was great but the Limoncello sponge cake was unbelievable! Soooo delicious. Every time we go to Mountain View, this is our favorite spot - and it NEVER disappoints. The drinks are inventive, the food delicious and always of high quality. They have the best Grilled Octopus salad. Service was great!! We had the octopus appetizer, the squid ink seafood pasta, and salami pizza. All 3 were excellent. It was our first time to the restaurant and it turned out to be much more casual than expected. Not a bad thing, in fact it would be a great place to bring a family for a good quality Italian meal. Noisy, but that is to be expected in a bustling pizzaria. Our favorite restaurant in Mountain View! Best pizza and salads by far! Love it! Birthday celebration w friends. 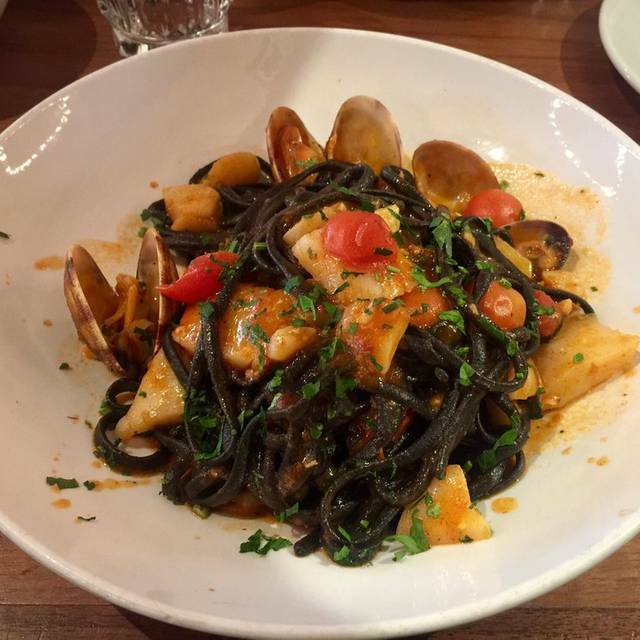 DZ is our go to place for pasta! It was last Friday. The food quality is very good and the service is very attentive and knowledgeable. It is always a pleasure to dine here. The salmon dish is overpriced. I told clearly to the waiter I don’t want green beans and tomatoes on my dish. They did it anyway. However, if you love pizzas, they have good selection of them. In the open table app it gave us the option to reserve outdoor seating which we selected since the weather was supposed to be gorgeous that day. When we arrived at the restaurant 10 mins before our reservation and gave our name they said that if we wanted to sit outside there was a group ahead of us and it would be another 45 minutes. What was the point of making the reservation for outside if it was going to take an extra 45 minutes? We were going to bring our dog but decided not to at the last minute and good thing too since we ended sitting inside so we could still keep our reservation time. The food is always good here but honestly this isn't the first time we've gone here and felt the service was lacking so probably wont go again and just order to go. Food was great. Server wasn’t very good. The most authentic Italian restaurant of the Bay! I can guarantee, I'm Italian, moved here only few years ago. Their pizza is better than many restaurants in Italy actually, because they do it Neapolitan style. Between the food, atmosphere, service, and drinks, Doppio Zero is sure to satisfy and envelop you in a beautiful culinary experience! Great as usual. This is our go to place for pizza and other Italian specialties. I loved the food, as authentic as it gets. Ambiance was good although it could use a bit more light and lower noise levels. The only complaint I/we had was with our waiter: an attractive Italian gentleman that seemed not to really want to be doing this job but something else in life. Food came out lightning speed. Appetizer within 4 minutes. Entrees while still finishing appetizer. This was dinner, not a lunch rush. Also. Salmon was very skimpy in the pasta. When we commented. The response was "sorry"
Great food and ambiance. I have been there numerous times and always enjoy it. Very good food. Good and attentive service. Good value. Appetizers were all excellent. Incredibly nice atmosphere and the service was phenomenal. The pizza here is also very solid neapolitan pizza. The pizza here could probably feed 2 people per, so the value is quite nice. Really wasn't expecting a negative experience at Doppio Zero. It has a great reputation up in San Francisco. But the food here just simply does not cut it. One appetizer (Croquettes) had to be sent back because it was still cold on the inside (not enough microwave time?). We ordered the pizza with ham, salame, artichoke hearts, etc. How something like that can be bland is beyond me. But my partner and I agreed there just wasn't anything there,. And it was very very soggy. We give the pizza a "D" and the rest of the meal a C-. Too many other places on Castro to pick before bothering with Doppio Zero. Food is in general outstanding. We love the pasta dishes, so flavorful. Service is ok, typical italian, could be more friendly, attentive, e.g. with filling water. first time there and everything was absolutely wonderful. the GM came up to us after and gave me and my GF a couple free beverages as well. will recommend to others and will be back soon. My first time there and food, service, menu, drinks great. Easy to get to, close parking, I give high marks, would recommend without hesitation for a nice casual place with excellent food. Service staff cares too, manager asks if everything was good, wait staff avail and attentive. Simply nothing wrong to write about ( ‘maybe’ limited wine list?) but that’s being picky. Surprisingly busy on a rainy Monday night. Pizzas are great here. No complaints. smelled like Lysol when we first entered at lunch time, but the service was attentive and food was tasty. Wood-fired pizza was great. In general I like this place but when waiter asked us if we want cheese he brought 2 glass shakers with grated cheese and red pepper flakes like in cheap pizza places... at that moment i felt myself embarrassed because I chose this place for dinner. Ate at DZ prior to theatre. Food was very good and enjoyed by all four of us. Service was adequate but less than attentive. Management stopped by a couple of times to ensure all was good. Very energetic and young crowd, so not great for quiet conversation. I particularly enjoyed the Calzone while my wife enjoyed the daily special of sea bass. Our friends both enjoyed the tasty pasta dishes. All-in-all a fun experience and we will return. Doppio Zero has become a favorite drinks & dinner spot for a fun time with friends. Delicious menu selections and amazing artisan cocktails from the bar. Try the Lemonchello cake for desert - do it, you deserve it. Friendly and attentive servers. Everything was very good! I went with my family to celebrate my husband's birthday and we had a really good time. The food was delicious, the service was quick despite that the place was completely full, and the admin and the rest of the team were very nice! Delicious Italian fare, intriguing cocktail list. What more could you ask? The staff were rude about the fact that we had strollers for the babies. I would understand that, but I had told them about it when making the reservation. They were generally quite unfriendly (except 1) and didn’t bring out everything we ordered.